Peacoats are very thick coats that are often made with wool and have collars and are double breasted. They most commonly have two verticle rows of buttons in the front, adding up to six buttons. If a button falls off or is missing, it is way cheaper to just sew a replacement on yourself rather than taking it to a tailor. Bring the coat with you to the craft store when you purchase the replacement button so that you can ensure the perfect match. Thread a needle using a thick, quality thread in a color that matches the button and the peacoat. Hold the needle with one hand underneath where the button is to go and use your other hand to hold the button in place. Poke the tip of the needle up through one of the holes in the button and pull it up until the knot catches. Return the needle to the inside of the coat by poking the needle downward through the next hole over. 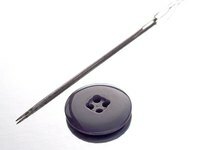 Continue to poke the needle up, over, and down through another hole in the button until all holes have been used and the button is secure on the coat. Push the needle downward one final time and knot the end again to hold. Cut the needle away from the inside of the coat using a pair of scissors.